Once again an alien movie themed level hits the MSDN. 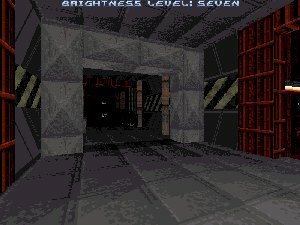 This is really alien movie looking level but because of monsters it doesn't reach the real feel (like SST TC's alien map did). Anyway design is average but dark so it can't be easily seen (of course alien maps are dark). There are some align bugs in walls. Lightning looks really good. Red lights and cyclers looks realistic and gives nice feel for the map. There are also new sound included with the map (from movies) and I love the 'emergency' one (from Alien or Aliens - I can't remember). Download this to have fun and especially if you are an Alien movie fan.